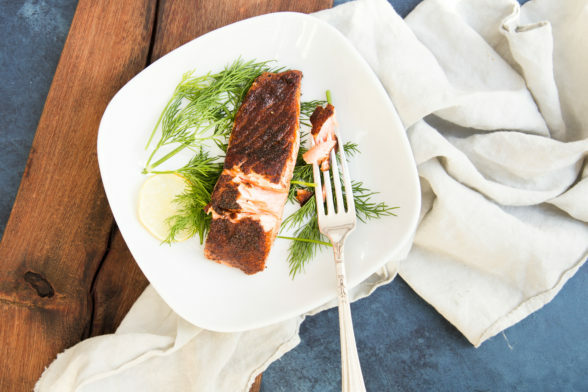 Although the best descriptor for this recipe is “Spice-Rubbed Wild Salmon,” I could just as easily call it what it better represents to me, which is “7-minute Salmon.” Or “Plan B Salmon.” Or my favorite “I-Cannot-Believe-This-Game-Is-Going-Into-Extra-Innings Salmon.” Of course, you can replace most of that phrase with “Orthodontist Is So Late Today” (Salmon) or “How Long Have You Known You Needed The Posterboard?” (Salmon.) My point is that sometimes no matter how organized I am about meal planning and how good my intentions are, life can get in the way. But in this case, desperate times do not call for desperate measures, nor do they call for take-out. They call for Plan B recipes! The other night I had every intention of making salmon in parchment, which isn’t brain surgery, but takes a few minutes. Things were not going my way — a conference call rescheduled for later in the day; a canceled carpool forcing me to do an extra pick-up; and hitting every single red light possible on the way home. I would normally just make everyone eat a little later, but Daughter #2 was starting a music class and she had somewhere to be pronto. Parchment was not happening, but I always have time to rub a few spices mixed with salt and pepper on some fish and cook it for 7 minutes. The combination of the earthy cumin, sweet cinnamon and slightly spicy chili powder is really tasty and not one flavor dominates, so do not fear that the chili powder will make it spicy. Mr. Picky does not like spicy at all and he does like this salmon, as does Daughter #1. Hubby is still “allergic” to salmon, so I made him a piece of spice-rubbed halibut instead. What’s nice about these spices is that they don’t confine you to one particular cuisine. I have served this with cauliflower and pomegranate salad, roasted root vegetables, a dozen different rice pilafs, tortilla soup and so on. What’s nice is that you feel like you’re eating something more special than just a plain piece of fish. In a very small bowl, stir together the chili powder, cumin, cinnamon, salt and pepper. Place the side of salmon on a cutting board, skin side down. Pat fish dry with a paper towel. Rub the spice mixture evenly over the top of the fish. Cut into 4 or 5 (or 6) individual servings (if using 24-ounce side). If you have time, allow the fish to sit coated with the spices for 15 minutes at room temperature. Heat a large skillet over medium-high heat. Add the ghee or coconut oil. 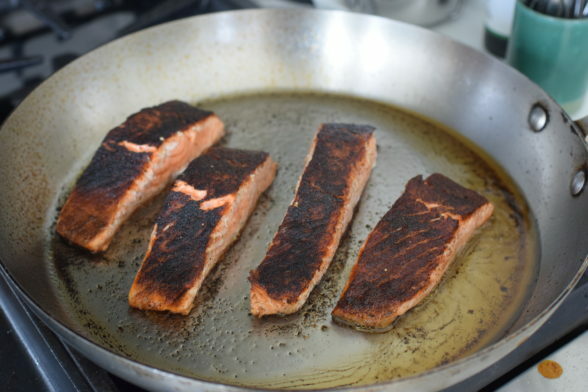 When the oil is hot, but not smoking, place the salmon spice-side down in the skillet. Sear for 3 minutes. Turn all the pieces over and cook for an additional 3-4 minutes. Do not overcook! Serve immediately. If you are using a salmon that is thicker than wild sockeye, you may need to finish it off in a 350 oven for about 6 minutes. You want the fish to get to the point where it starts to flake with a fork, but is still slightly rare in the center – it will keep cooking off the heat. yum yum yum…super fast. super easy. super deelish! thanks!! Is it necessary to keep the skin on ? No, but it’s very easy to remove after it’s cooked and I think it helps keep the salmon moist. This was delicious and a big hit with the family. This is one of my favorites! Thank you for taking the time to write in! A cedar plank would be a great way to cook this! The smoky flavor would add beautiful flavor to the fish. You do not need to sear this for it to taste delicious! Delicious, made this last night. So easy it felt like I was cheating making such a wonderful dinner in record time. Served w/ rice and a kale salad. This will be my go to salmon recipe. I grew up in the Washington state and I can’t wait to share this with my relatives back home that always have salmon around. We make this all the time, it’s one of our favorite easy dinners! If I wanted to make the spice mixture in bulk and keep it in my pantry. How much is the one recipe amount? Thanks for making dinner time so effortless, healthy and delicious! I like the way you think! 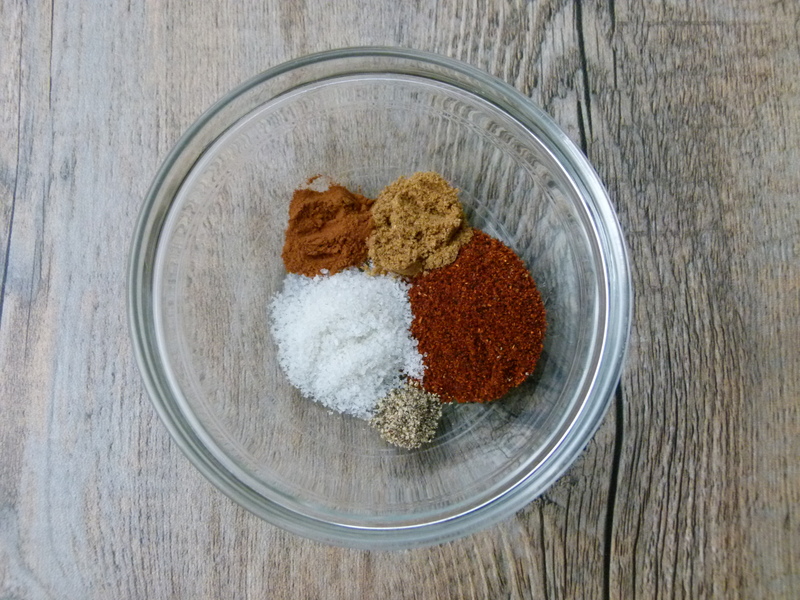 If you add 1/8 teaspoon of black pepper to the mixture, you’ll have a perfect 2 teaspoons of spice mix. 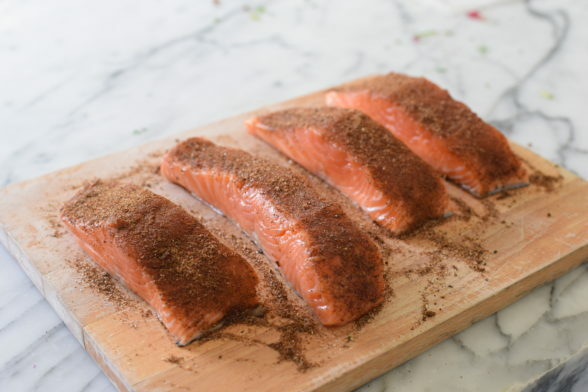 I’ve been desperate recently for a salmon rub that doesn’t contain any sugar but is still interesting and yummy enough that I can persuade my flavor-shy mother to taste it, and this handily fits the bill. Even better, it’s incredibly easy and I love it too! In fact, I think this will be my new go-to for salmon! I made this last night and it was a hit – even better today atop my kale salad! SO great to hear, Devvon! Made this tonight and it was wonderful! I substituted chipotle powder for the chili powder (I like the smoky taste) and it was delish. I served it with South Beach Oriental slaw. I will be making this again. I am crazy about ground chipotle powder! I bet that was delicious. Thanks, Sue! We had the salmon, along with the carrot/avocado/sunflower seed salad, for dinner last night. Everyone in the family, from the adults to our youngest child, loved the meal. And it was all so easy to make! Wonderful. I’m so glad the kids enjoyed it! Those are two of my favorite recipes — what a lovely meal! Great alternative to my basic salmon recipe (salt/ pepper).. Also, loved the coconut oil w/ it. I usually use organic Macadamia oil, is that a safe oil to use with high heat? Did the shredded sweet potato recipe w/ it which is divine! You can use macadamia nut oil — fewer Omega-6’s and more monounsaturated fats. I love coconut oil, though! Loved the flavor of the cumin and cinnamon combined with the chili powder! It was fun to prepare salmon in a new way. Thank you! You’re welcome! It’s not an expected combination, but I think it’s totally delicious. Everyone loved the salmon last night!! A total hit (even my picky 4-year old asked for seconds!!). We eat a lot of broiled salmon so it’s nice to have another yummy option. How great that your 4-year-old is eating salmon — so amazing for brain development! Thanks for the feedback. This was delicious! It will become a new staple for us. Thank you, Pamela! You are so welcome. Happy that you enjoyed it! I am not a huge salmon fan but try and eat it once a week. I have tried so many recipes and haven’t found one that I am thrilled with. Excited to try this one – the addition of the cinnamon seems really interesting! Yes, do try it! 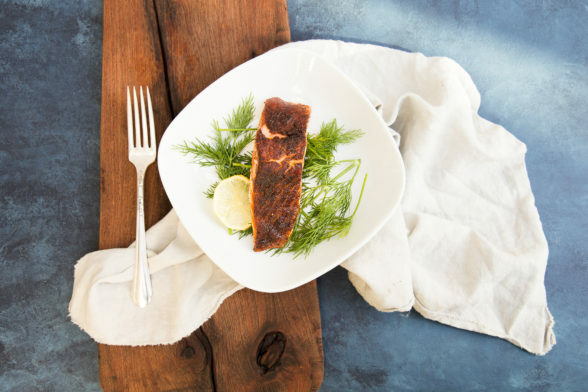 You may want to go for King salmon, which has a milder flavor than Silver or Sockeye. It’s a little fattier and thicker, so you’ll need to cook it a minute or two longer.